Having gained an appreciation of the things to see in the city, and with our Innsbruck Cards ready for use we set out in the morning to look at the things we had made a note of earlier. The clouds were over the mountains so we thought it would be best to do the in town items first in the hope that the clouds would lift later in the day. 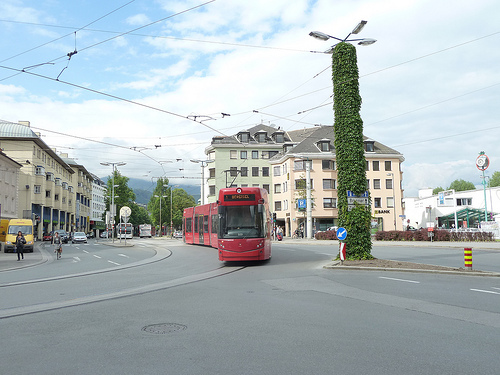 Many of the city lamp posts are covered with vegetation - at times this obscures the road signs. The Court Church was first on the list. Quite impressive with a large mausoleum built for Archduke Ferdinand. It took 100 years to complete and has never been used, his bones are at Wiener Neustadt. This is a typical example of the excesses and arrogance of the monarchy. The Museum of Tyrolean Folk Art exceeded our expectations with many well thought-out displays. We were particularly impressed with the reconstructed rooms. All in wood, and presumably all original. Next on the list was the Hofburg, the Imperial Palace. This bore a resemblance to Versailles with its hall of mirrors. Another example of the incredible excesses of the monarchy. The palace is well maintained and preserved. Our final visit was St. James' Cathedral. Again, this was well maintained. The Innsbruck Card certainly made it easy to obtain entry, no line-ups and the automatic ticket readers speeded things up considerably. There were still clouds at the top of the mountain but we decided to go up around midday. 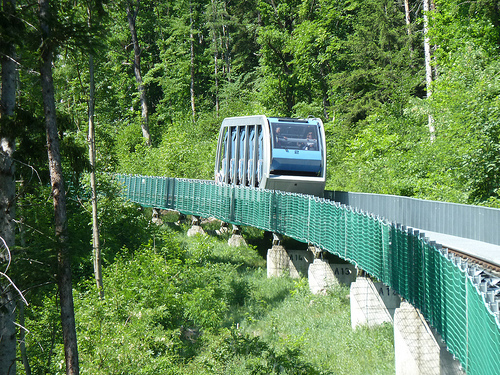 The first part is a modern cable railway, the Hungerburgbahn, with a bridge over the Inns river. It is partially in tunnel and there are stops at the river and also the Alpenzoo. We transferred directly to the cablecar to Seegrube and again directly to Hafelkar. It was still cloudy at the top but breaks in the cloud gave us some good views of the mountains. We came back down again to Hungerburg which was in full sun. Lunch was a beer with goulash soup/soup with a bacon dumpling. Both dishes were local specialties. Soup with a bacon dumpling. The Innsbruck card also allowed us to enter the Alpenzoo which, in many ways was a mistake. For at least half of the cages we couldn't find anything. Many of the areas were heavily overgrown and had many dead trees in them making it extremely difficult to see the animals. The vultures and eagles looked very sorry for themselves in their cages while the bear was pacing back and forth in the same part - a sure sign of stress. The moose had a very small, hillside area and this for an animal which spends much of its time in water. There were two beavers, one of which just swam round and round and round - obviously stressed. In a word the Alpenzoo is disgusting. It should be closed, or left just for the farmyard animals who are used to being cooped up in small areas. We sadly made our way back to the Hungerburgbahn and returned back to Innsbruck. Later in the early evening we took tram #1 to the end of the line close to the Inns River and walked along a very pleasant riverside path back into town. The Imperial Gardens were well worth a visit. In one part a number of people were playing chess with giant pieces against a backdrop of yellow Iris. By the pond, a family of ducklings was settling down for the night. Ducklings getting ready for the night - the mother had already settled down, invisible in the grass a short way away. We found an out-of-the-way restaurant not five minutes from the main tourist area. We each had a beer and Tyrolean Grostl - beef heated in a pan with potatoes and onions. There was a side salad. It was excellent but very filling. The waiter told us it was a typical dish of this area. We leave Innsbruck tomorrow so need to get out all our information on Salzburg.